Marrakech is a city on steroids. At least, some parts of it are. We fixed on Morocco as a vacation destination, and it was only because… well, where do you go in the dead of Northern Hemisphere winter? India was too far, and Europe was too cold. North Africa seemed a good option. In fact, we had decided to visit Morocco in 2017 but P’s father had had to undergo surgery, and we ended up canceling all plans. 2018 came around, and this time we made it to Morocco. 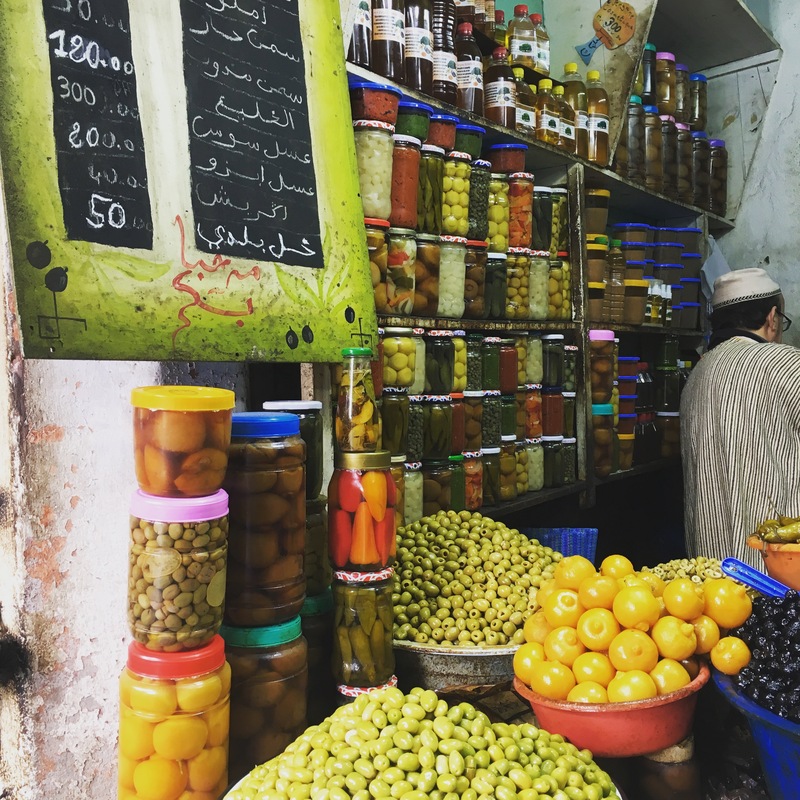 There were two cities on the itinerary: Marrakech and Essaouira, two places that couldn’t be more different from each other. 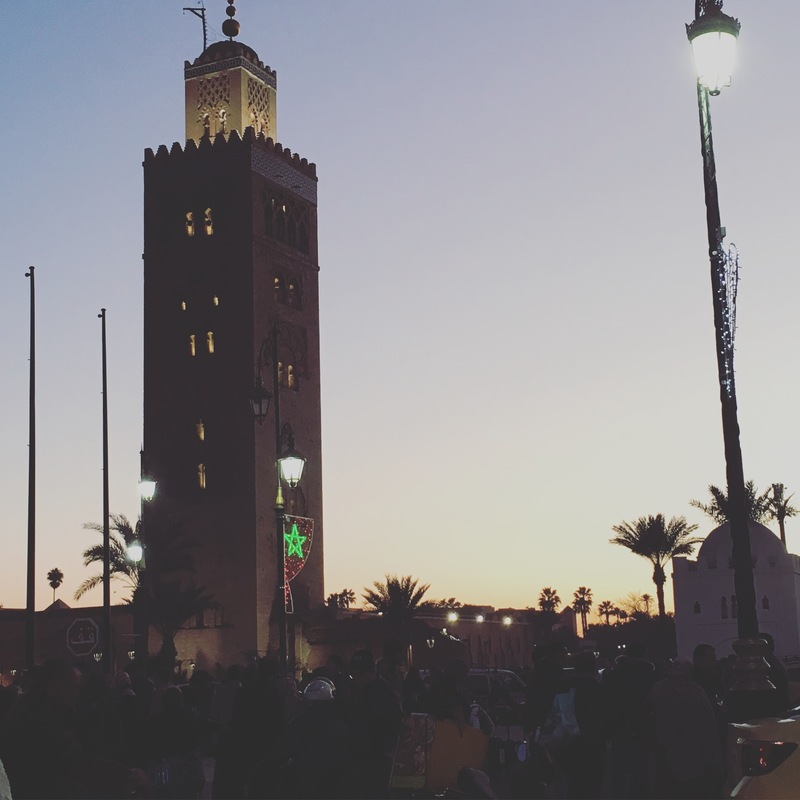 Marrakech is colorful, loud and exciting, sometimes dizzying in its intensity. 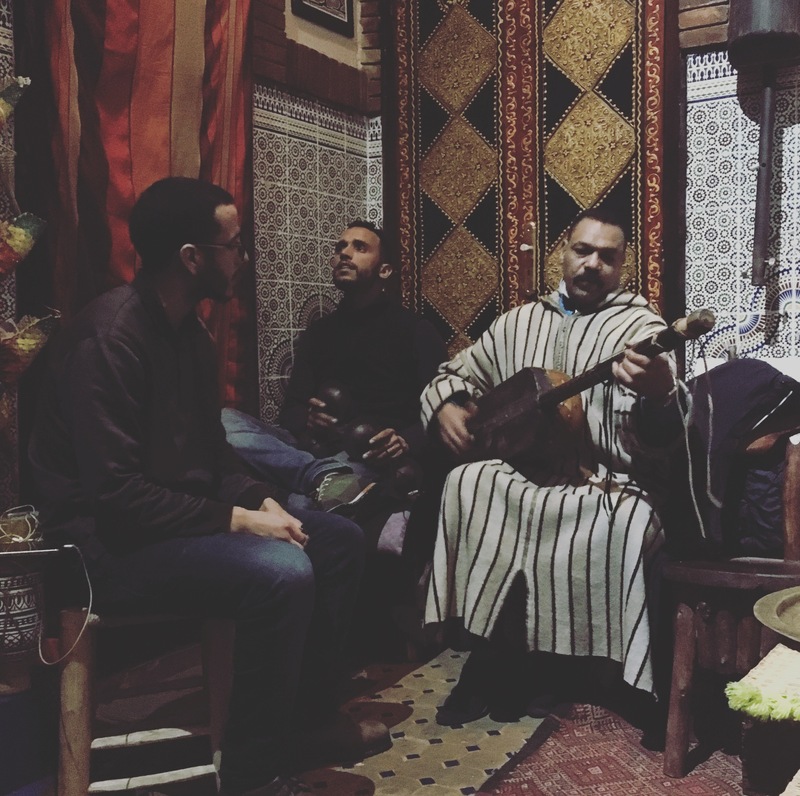 It is a city of winding lanes, old Riads with colorful tile inlays, outdoor cafes and cigarette smoke, Hammams and leather shops and old museums and brass lamps and sticky sweet treats, and everything else you’d ever want to bring home with you. 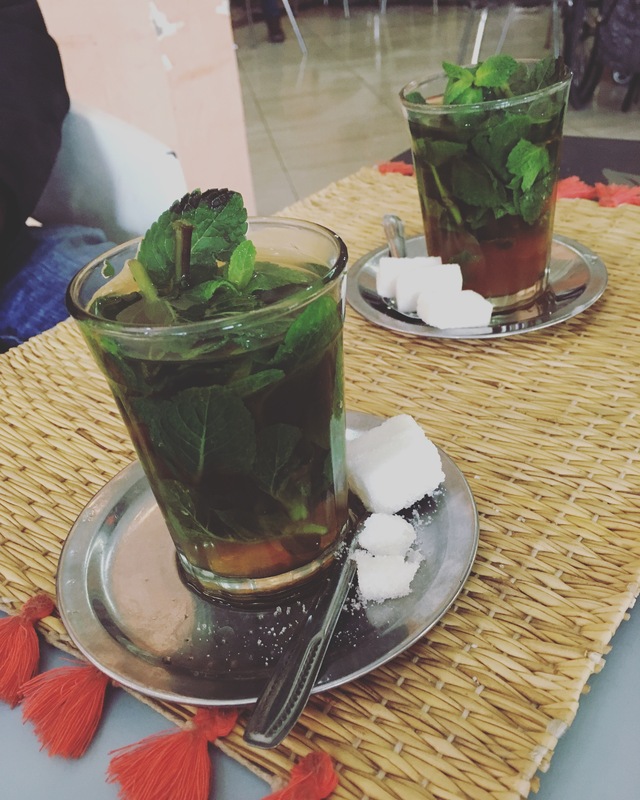 In contrast, Essaouira is like a chilled sorbet, or cool warmth, shining blue skies and seagulls in flight, families admiring the sunset at the promenade, sipping mint tea in the old square. We landed one afternoon at Menara Airport. Our AirBnB hostess had arranged a taxi that brought us home. During the taxi ride, I realized that my knowledge of Arabic had dwindled to basically, nothing. I’d lived a year in Cairo (2002-03) and picked up a smattering of Arabic around that time. But it was so many years ago, and I recollected very little. My knowledge of French was somewhat better, and P has some familiarity with French too. So we figured we should stick to French and give up on speaking/deciphering Arabic, sigh. Riad Larouss is a small neighborhood, and that’s where Valeria runs her cozy little AirBnB. We had a sweet little room, and there was a common area for breakfast and lounging. Valeria gave us a map with markers showing the locations of the Riad, the bus station, Jemaa Al-Fenaa, Old Medina, museums, etc. She was a wonderful hostess, and we got off to a great start discovering the vibrant city that is Marrakech. We went out the same evening and walked to the Medina. It was late evening, and the central square known as Jemaa Al-Fenaa was already filling up with food vendors and street performers. The air was cool, and I felt so comfortable, so happy to be in Marrakech. I felt very much at home… there was an instant connection, a sense of warmth and joy and familiarity that pervaded the entire trip, really. Perhaps it came from the fact that I had been in North Africa before, that I had fallen in love with Arabic language and culture all those years ago? We had a couple of days in Marrakech before we left for Essaouira. So we did what all tourists do. Walked through the countless lanes in the Medina, all ending in Jemaa Al-Fenaa; bargained in a very decent and honorable way for a beautiful silver teapot; landed up at a quaint store selling all manner of olives and pickles where the owner, a sweet old man, generously allowed us to taste an assortment of items (we bought so many kinds of olives); gawked at the gorgeous Bahia Palace; walked and ate and walked and ate. The search for vegan food takes us everywhere, and I have learned that it’s mostly good to steer clear of eating joints that have “vegan/vegetarian” in their name or description. You will be better served by finding out what local dishes you can consume safely and happily. And we learned that harira and tajine, two North African preparations, can be made vegetarian. We chanced upon Dar Mama, a tiny eatery situated close to our Riad, run by a group of young men (Senegalese?) who played the most amazing North African music on their boom box, and kept the space warm with a tall brazier. This was February, cold and rainy sometimes, and we were happy with all the warmth we got. Harira was delicious, as we realized. Day 1, P and I shared a bowl. Next visit, we ordered a bowl each. Then, we ordered two bowls each! 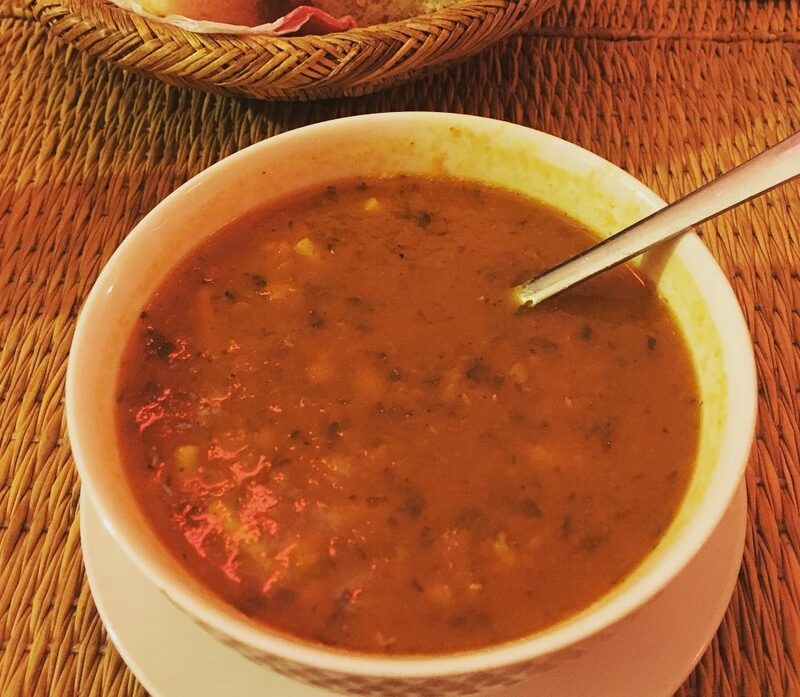 Harira is a chunky soup of chickpeas and tomatoes, and it kept our insides warm and comfortable as we walked miles through cold and wet Marrakech. We ran into some drama, and yes, it was on my account. 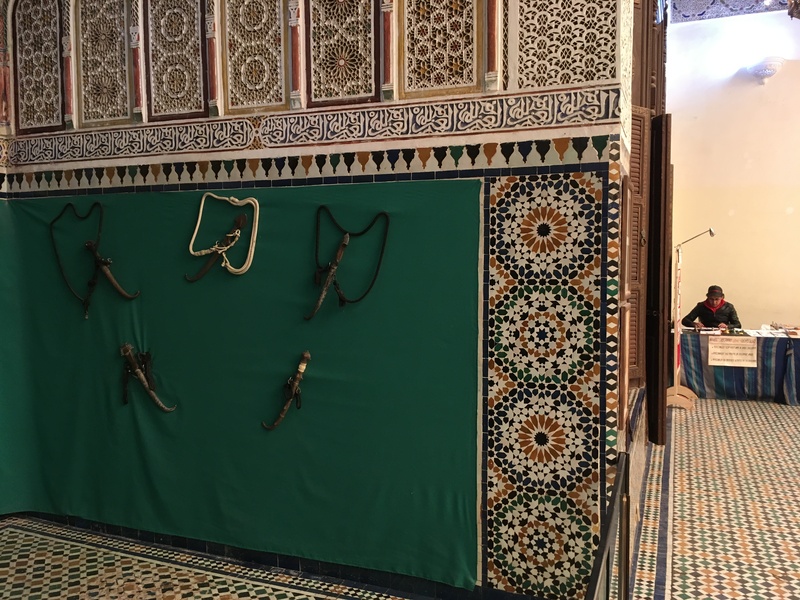 Turns out that I had booked our Riad for two nights, and we were in Marrakech for three nights before heading out to Essaouira. It was a mad scramble, as we frantically tried to find a place on AirBnB to spend the night. We were lucky. We found an old Riad, managed by a pair of friends. They ran the place like a hostel for friends. They served us a sumptuous dinner. They had a folk musician visit that evening who played for hours, lulling us into a sweet space that felt raw, special. They served us the best breakfast ever: lacy beghrir, toasted Khobz, delicious Msemen. Every meal included mint tea, freshly squeezed orange juice, butter and jam. We feasted like kings. It was such a precious experience, and it came about because of my AirBnB gaffe! We headed off to Essaouira the next morning in a state of wonder, and also understanding that THIS is what travel teaches you. To be spontaneous, to be courageous, to have faith in oneself and one’s partner and in the kindness of strangers, to be aware without being fearful, to be both kind and accepting of kindness. Meditation. Food. Music. Yoga. Photography. Books. Art of Living. Nature. I keep stumbling on pictures from Morocco and I am hit with such waves of nostalgia of Morocco calling me back. Thank you for sharing the images, the experience, the food, the MUSIC. I hope Morocco was a magical trip for you. It was warm and magical, and so much so that I felt a real pang leaving. Felt envious of all the people landing in Marrakech that day. © 2019 The Rich Vegetarian. All rights reserved.